On a recent lunch trip into Richardson Farms (located in White Marsh, Maryland), I spotted a single cupcake flavor in their bakery display. This was my first time in Richardson Farms, but I’ve only heard amazing things about their food, so there was no question that I was getting the Cookie Dough cupcake to complete my lunch order. I was excited to try this cupcake since it was an unexpected treat, and it wasn’t an everyday classic chocolate or vanilla. Unfortunately it was only okay. The frosting was just a standard buttercream, and nothing really stuck out as amazing or unique about it. The cake was dense, crumbly, and a bit dry. Luckily the “cookie dough” portion of the cupcake was really good, and totally saved this cupcake. When eaten with the cake and frosting, the flavors all balanced out really well. 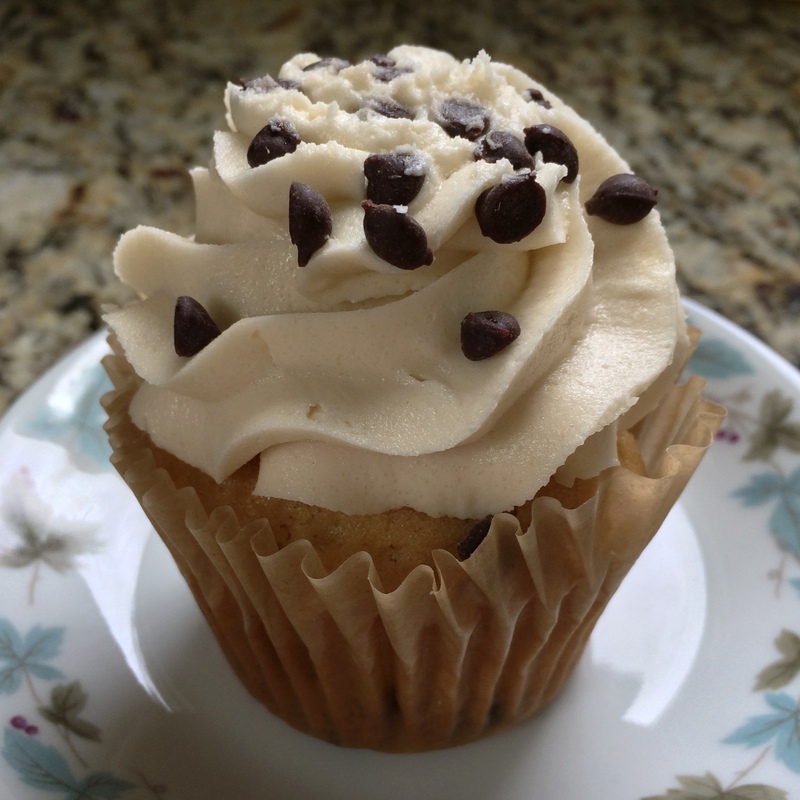 I don’t know if it was intentional, but the “cookie dough” part was fully cooked and at the bottom of the cupcake. I think it would have worked better at the center of the cupcake (and more “doughy”), but since it was a large cupcake, I ended up eating it with a fork so that didn’t matter too much. The man working in the bakery department was very nice and served up the cupcake with a large smile and told me that this flavor had gotten approval from his family. Because of his hospitality, the decent price (only $2.50), and the overall flavor combination, I would give them another try to see if the cake’s texture was better on other varieties. And who can say “no” to a pretty cupcake served with a kind smile?